SealMaster® has the industry’s largest network of professionally trained sealcoating contractors dedicated to assuring successful results at competitive prices. Our vast network of highly trained sealcoating contractors are available to provide on-site pavement inspections, recommendations, free estimates and full application services to assure quality results on every project. Simply click. Professional sealcoating contractors rely on SealMaster® as their One Stop Source for asphalt parking lot, driveway and road sealcoating and asphalt repair products and equipment. With everything under one roof, sealcoating contractors save valuable time and money on the products, tools and equipment necessary to do the job right. Each SealMaster location is staffed by professionals dedicated to helping your sealcoat contracting business grow. For decades, quality driven sealcoating contractors have relied on SealMaster for their asphalt sealcoat products and sealcoating equipment. Innovative products, from asphalt sealer to asphalt repair and seal coating and crack filling equipment, along with unparalleled service, have made SealMaster a global leader in the asphalt sealcoating industry. SealMaster® … The Most Trusted Name in the Sealcoating Industry for More than 40 Years. If you are a sealcoating contractor, click to learn more about the SealMaster® Contractor Advantage. For decades, sealcoating contractors have relied on SealMaster for quality asphalt sealcoating products, seal coating and crack filling equipment and unparalleled SealMaster service and support to help their asphalt sealcoating and maintenance business grow. 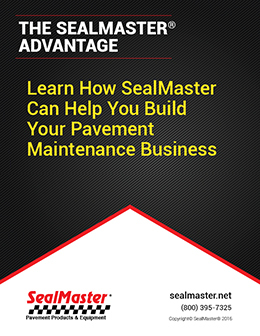 Download this FREE white paper to learn how SealMaster can help you grow your asphalt sealcoating contractor business.